The week has just flown by again, I've no idea where the time goes. I've been doing some papier mache last week and have almost got my big vases ready for painting. The rule is a standard 30cm (12") so you can see they are quite big.I will be making some large papier mache flowers for these as well. I have also been working on a fairy, dragon and a couple of bowls but haven't had time to put pics up yet. I haven't done much with the marquetry as it really requires steady hands and mine have had the shakes all week. Pop over to Wendy's Blog at 1st Unique Gifts to see what everyone else has been doing for Handmade Monday. Just cannot remember the last time I worked with paper mache... I don't think I got past the money pig made from a balloon and egg box parts! Your vases look much more sophisticated. They look great-I'm interested to see what they'll look like painted! These are great and I'm sure will look really effective when painted up, look forward to seeing them! This blog takes me back to .... years ago and agree with Ros think did not progress beyond the balloon stage. 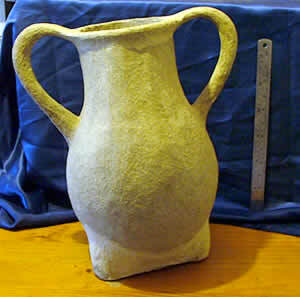 Wow - brilliant vases - very classical, like Greek urns. Can't wait to see them painted and with flowers. Looks like you're having fun! They are fab! Would love to see them when they are painted! 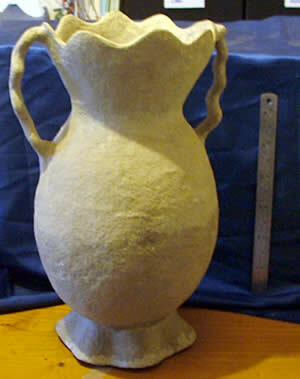 Haven't done any paper mache since school days - to far back to remember. They look great, look forward to seeing the large flowers for them. Papier Mache is something I love, I'm trying out a few 'recipes' at the moment to see which one suits me best, I'll keep you posted, yours look really brilliant. wow! great vases! thats pretty advanced paper mache! well done! cant wait to see them decorated!! 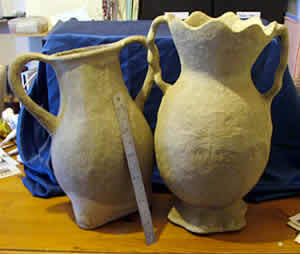 These vases are very lovely and beautiful. I especially love the ones with the waves. It's very organic and stunning.